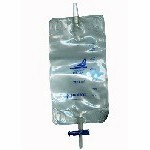 The Freedom disposable urinary drainage bag or "leg bag" is constructed of a soft, comfortable and sterile vinyl. These secure bags come in 500ml (16.91 oz or 2.1 cups) and 1000ml (33.81 oz or 4.27 cups) sizes with your choice of either a T-Tap drainage port or a Twist system drainage port. This product is 100% latex free. Although we promote the Freedom Leg Bag to be used with the Better Pant (see right column), the leg bag package includes two latex free hook and loop style closure straps. 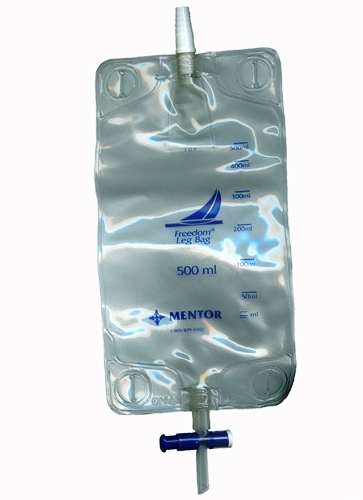 An external catheter, such as the Clear Advantage Condom Catheter (see right column) or the Gizmo Two Piece Condom Cather (see right column) is needed to connect the tubing which is then connected to the leg bag. The Clear Advantage with Aloe combines the advantages of a 100% silicone male external catheter with the additional benefits of Aloe without compromising adhesive strength. Aloe has been known to help promote healthier skin. 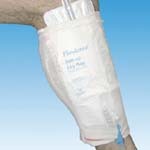 The flexicare disposable leg bag offers maximum comfort with its durable, skin friendly woven fabric backing to reduce skin irritation and perspiration. This knitted leg bag holder offers comfort and security by distributing the weight of the bag evenly around the leg or thigh.